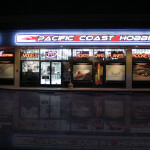 Pacific Coast Hobbies joined racing series Formula “D” at this sold out event. Pro skater Bucky Laske and Viva LaBam’s Ryan Dunn joined PCH for a 1/10 Scale R/C Drift. Thanks to Yokokmo for sponsoring the R/C drift race.